Callie boots c/o 80%20 (on sale here). I forgot how difficult having a blog in New York during winter actually is. This frigid weather is miserable! But it's also kind of a fun challenge to head out in sub zero temperatures and try to figure out a way to look cute while also staying warm. My trick? Well, for one (sorry, PETA) fur. 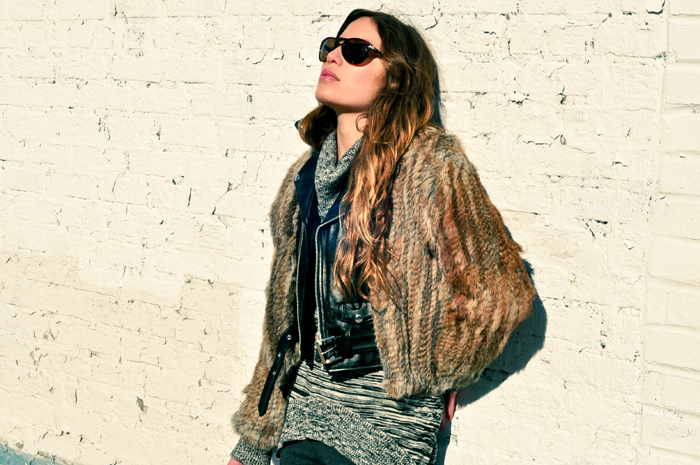 This new moto/fur jacket blend has become my go-to coverup this winter. It looks great with just about anything, and ensures that even if I'm wearing sweatpants and a tee underneath, I look moderately acceptable in public. Another trick? Invest in great sweaters. This tunic-shaped, marled number from Brooklyn Industries is a great layering piece, and adds a fun dose of texture to any look. Final trick: tights under pants. I'm telling you ladies, this one really works. No matter how you do it, stay warm out there! I'm loving the layers! Def my favorite thing about winter. Gorgeous photos, and great tricks for staying warm! That jacket is killer, and tights under pants is so the way to go. Love this! Tights under pants are always a good idea when it's too cold outside. Love the bag. YES i do tights under pants! Haha, I do underarmour leggings under pants...now that gives you fat legs but its so worth it! I have to buy some of my jeans too big haha! LOVE your marled sweater. so cute. And yeah taking outfit pictures is so hard in winter! Totally understand about the freezing weather! But you look darling! Love the last shot! Hi dear, this is a genius mix of textures, layered excellently. Love the style of the bag. Amazing outfit an wonderful wonderful pictures! at first i thought the blog post title said "let's get married"!!! ha ha. in LOVE with that coat. and that bag is pretty awesome too. Tunic sweaters! I've been loving these guys where I live too and the weather isn't bad at all. I think tunic sweaters is my one big favorite this year! Weather like in NY is brrrr... cold but great for layering! Love how you do yours! love these photos! this outfit is fabulous! i do love fur and that jacket is beautiful! Love love love this look! I'm obsessed with that leather/fur jacket! Too fierce! Really loving this layering and the photos are great, very editorial.